If the first thing that comes to mind when you think of protecting your home is a big growling dog, it’s time to talk about technology. Today there are numerous devices and emergency systems to make life less worrisome, not to mention quieter, for homeowners. You may be surprised to find what’s new in home security technology. Smart devices and wireless enabled alarm systems are now easier than ever to implement. While the features offered are more extensive, they’re also user-friendly and designed for people with busy lives. Before we get into specifics, note that this equipment is capable doing more than securing your home from intruders. In fact, many of the features sync with household appliances and other electronic devices. Programming your home to be more safe and convenient is actually quite enjoyable and simple. Let’s take a tour of some of these new security systems, surveillance devices and gadgets. These security set-ups are exactly what you think they are. They come with a control panel and motion sensors that detect when a window or door is opened. In addition to arming and disarming these alerts when you’re away and asleep, you can choose to subscribe to a monitoring service that will alert authorities when triggered. Some security companies provide this monitoring with the package. If you’ve ever had a security set-up before, this probably all sounds familiar enough. In addition to coming with more durable, accurate equipment, the extras are where things start to get most exciting. These are all designed to give you more control of the system and remote access to other devices. For example, these systems can connect with smartphones so you can arm and disarm them from afar, as well as be first to know if they’re triggered. You can also add features like displaying the day’s forecast on the wall panel. Integrate the system through a smartphone app and you may also be able to control heat, air conditioning, locks and lights. Families on a budget will particularly appreciate that affordability of these systems. Many come in customizable packages with low monthly rates. Video recorders are a big part of what's new in home security technology. They've come a long way since the hefty recorders installed in convenience stores. Many motion activated cameras can be hooked up to your Internet router so you can connect to the cameras online via your computer or phone. 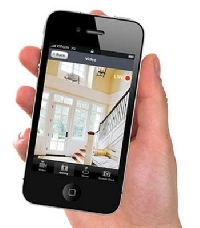 This visual connectivity allows you to check-in on what’s going on in the home in real time. This includes when repair men are around, babysitters or when the kids are home alone for a few hours and gripe about you calling to check up on them. Think of the peace of mind your phone will provide when you can tap into your empty living room from one thousand miles away. You’re not alone if much of your more expensive possessions are located in the garage. Security sensors for garage doors offer extra protection for your tools, vehicles, lawn mower and other valued miscellany. These sensors activate the entire alarm system as the door tilts. This means you and your monitoring company will be alerted the moment the door begins to open happens in order to mitigate intrusion. When your home is not under attack, these sensors make life easier for you when integrated with the wireless system. From your phone you can double-check the garage is locked, so no more “Did I/ Didn't I lock it?” worrying. What’s even better, you can use your phone to unlock the garage for house sitters, plant waterers and anyone else with permission to enter your home. That's the overview of what's new in home security technology. It’s nice to know you’re not alone in securing your home, especially when you’re away!